The Mail Boxes Etc. post, parcel and print store at 143 Kingston Road, Wimbledon, is under new ownership. After a career in engineering, Chetan Patel decided to turn his hand to retailing, and took over the thriving Wimbledon store on 20 November. He is looking forward to providing customers old and new with the mix of friendly personal service and reassuring expertise that has already gained the store a strong local reputation. Asked why he decided to change direction, Chetan said that the mix of everyday services and the chance to work with members of the public attracted him to this opportunity: “I was doing well in my job but I wanted a new challenge,” he explains. 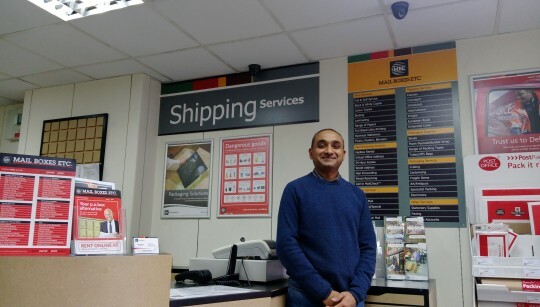 The store has something for everyone: “We offer Royal Mail postal services without the queues; fast and easy parcel delivery using UPS, DHL, FedEx and other big brands; a mailing address and virtual office service; design and print; shredding and secure data destruction,” Chetan continues. As well as serving the local community, Chetan is very much looking forward to the influx of visitors that the annual Wimbledon Tennis Championships will bring. “I’ve heard that the tennis stars often use our shipping services to send items back home or send their kit ahead to wherever the next tournament might be,” he says. Mail Boxes Etc. Wimbledon is open from 9am to 5.30pm, Monday to Friday, with plans to extend weekday opening to 6pm and introduce Saturday opening in the New Year.